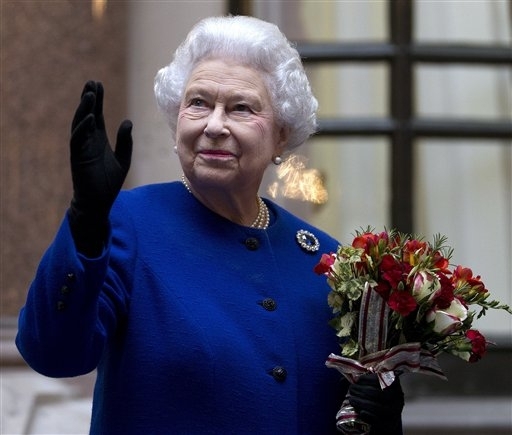 LONDON (AP) — She commands obedience only from her staff and her corgis, but Queen Elizabeth II has been named Britain's most powerful woman by a BBC radio program. The monarch topped the list of 100 female figures announced Tuesday on "Woman's Hour," though she is above party politics and her role in government is limited to formalities. The list was dominated by business leaders and politicians. Home Secretary Theresa May — Britain's interior minister — ranked second, followed by Ana Botin, chief executive of Santander U.K. bank. The top five also included Supreme Court judge Brenda Hale and Elisabeth Murdoch, chair of television company Shine Group and daughter of media mogul Rupert Murdoch. The list was assembled by a panel that included journalist Eve Pollard, politicians Priti Patel and Oona King and crime novelist Val McDermid. Pollard said those in the list "were judged to have power because they had reached a place where they have control — of policy, of direction, of influence, of staff." She said she hoped the roster would "shine a light on those sectors where too few women are getting to the top, like politics, FTSE companies, the military and journalism." Others who made the list included Justine Roberts and Carrie Longton, founders of the website Mumsnet; Random House CEO Gail Rebuck; and "Harry Potter" author J.K. Rowling. Among those omitted was the former Kate Middleton, wife of Prince William. Pollard said the judges felt Kate had enormous influence — but not, yet, power. Archive is an online platform that serves to preserve the historical record of all news publications in the Maldives.